We are happy to announce the general availablility of two new iPhone applications from Nettica: "DNS Lookup" and "DNS Lookup Plus". DNS Lookup is a free utility that allows a user to query a DNS server for an A record. 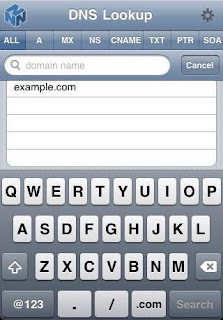 To learn more and install DNS Lookup for iPhone, click here. DNS Lookup Plus is a full-featured DNS query tool that allows you to query many common record types. Dig-like response format including query time, current time, and server address. To learn more, and to install DNS Lookup Plus, click here. These applications are for iPhone OS3.0, and work with iPhone 3G, iPhone 3GS, and 2nd Gen. iPod Touch. Please contact support if you have any problems using the utilties. We are very happy to hear feedback!